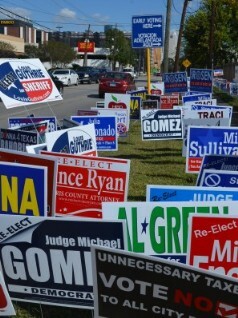 Today is the last day for early voting in Texas. Polls are open from now until 7 pm. You can vote at any early voting polling location in your county. If you haven't voted yet, please do! If you have, spend a day calling your like-minded friends and getting them to vote. Let's don't just win - Let's send a message across this state and all over this country! The socialist agenda of the Democrat Party shall not stand. Some of the most import races on the ballot, the one that directly impact your daily lives are on the bottom part of the ballot. Who is going to be your next sheriff? Who will prosecute the criminals in your courts? Who will sit in judgment of cases? And who keeps an eye out for the ethics of all county government employees? All of these, plus school board and bond issues that directly affect your pocketbook and quality of life are down the ballot. But often, these important races are "undervoted". In other words, people go to the trouble of voting but don't go down the ballot and cast their votes in very important races and issues. Following are links for voter information for voting locations in the major counties where information could be found. For other counties, contact your local County Clerk or Election Administrators Office.